The Attila who Verdi and his librettist, Solera, present to us, is not the brutal savage of tradition; he is much nearer to the noble savage. That is not surprising when we know that Solera had based his melodrama on Zacharias Werner’s play, Attila, König der Hunnen, which in turn, is based on Nibelungen sagas. Heavy stuff, maybe, but all the same, convincing in the way that melodrama can sometimes be. Conviction was always a Verdi quality; even when he is wrong, he convinces us that he is right. Shakespeare knew that to make a villain convincing, he must be given lines to bring about audience empathy. The Macbeths are lovers before they are murderers. In the opera, the noble streak in Attila is underlined at the expense of his savagery. Our attention is held. Verdi and Solera are excellent attention-grabbers. Yet for all the musical conviction in implausible and contrived situations, Verdi was still giving us standard, cardboard operatic characters. It was not until his next opera, in the person of Lady Macbeth, that Verdi created an utterly convincing (and in this case, chilling) character. From Atilla to Rigoletto is five years and nine operas distance. And it was only in the latter opera that the maestro gave us an entire cast, including the minor characters, that were musically and magically created. Fortunately, Pier Luigi Pizzi is such a musical stage director that he overcomes the cardboard character problem. No mean feat. The production was first seen earlier this year at the Rome Opera’s indoor theatre. It didn’t work nearly so well in the indoor Opera as it did at the Caracalla. That is surely because the director had been informed that the indoor production would have to work also out of doors. Unsurprisingly it looked cramped at the Opera, but blossomed into breathtaking majesty in the Caracalla setting. The entire production, including costumes is in black and white, relieved only by bright red of Atilla’s cloak, and later Odabella’s, after we should assume that she too has joined the Red Party. The lighting is predominantly white throughout, which jarred indoors, but at the Caracalla was magnificent, uplifting as well as alarming in an uncompromising mode. All this against the backdrop of the original stones of the Baths tinged in red light, was memorable. Maestro Pizzi began himself as an architect and has an irresistible urge to use the chorus as scenery. The tableaux is his speciality. And while they often looked out of place in the theatre, the Caracalla setting brought them to life. The chorus sang magnificently and were manoeuvred to the last millimetre to strike these memorable still-lifes. When the maestro took his final bow, he hurried through the row of principals and hugged and kissed the leading members of the chorus for their precise performance of his minutely detailed requirements of his direction. They in turn, burst into applause for him! And that brought a crescendo of applause from the audience. Cardboard, stereotypes these characters may be, but Verdi’s glorious melodic invention was already to the fore. And vocally there was much to be enjoyed. The Bulgarian bass, Orlin Anastassov has all the authoritative ringing tones of his fellow countrymen and an impressive statuesque physique, wonderfully exploited by the director. Between them, they brought the noble savage to life. The Venezuelan soprano, Lucrezia Garcia, is possessed of a voice which Anna Russell used to observe unkindly but not inaccurately as having a good cutting edge. There are not too many singers these days that can plaster you to your seat with a sheer volley of sound, but Ms Garcia is certainly one such. Her voice is enormous with some perfectly intoned pianissimi as well as the stunning, hypnotic blasts of drama. A perfect warrior maiden. Stately in her movements too. There were moments when she succeeded in bringing the cardboard Odabella to life. A truly memorable show. From Bulgaria too came Kamen Chenev as Foresto, Odabella’s hapless, confused lover. 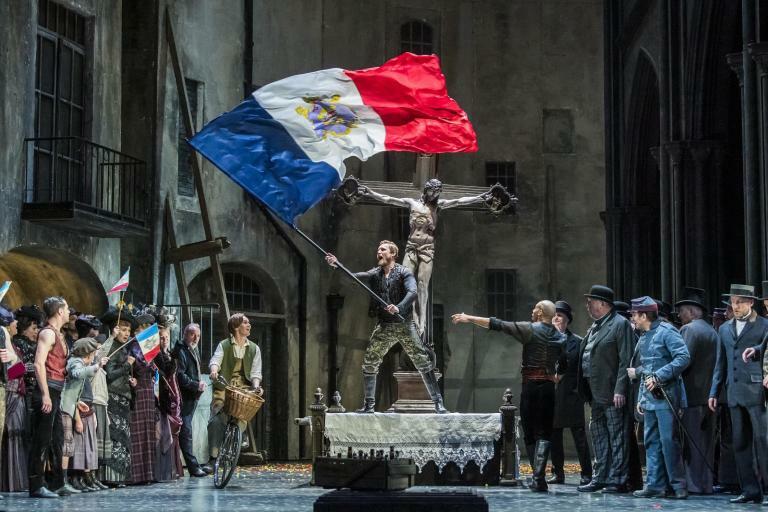 It’s not Mr Chenev’s fault if he cannot make any sense of Foresto; the composer and librettist made so many changes to this role that no one on the right side of sanity could be expected to untangle the mess. But Verdi does provide some exquisite melodies for him and the Chenev voice is powerful as well as expressive; the perfect combination for early Verdi. The baritone, Dario Solari, is from Uruguay, and made a great impression as the Roman General turned traitor. His voice is blessed with some beautiful dark colours, especially suited to the role and most notably in his stop-the-show aria of the second act, Dagli immortali vertici. One of Italy’s finest conductors of opera, Donato Renzetti, arrived at Caracalla knowing that the orchestra were already familiar with all the perfect tempi for this melodrama from their performances recently with their Honorary Chief Conductor, Riccardo Muti. But Renzetti made his own special contributions to this performance. His rhythms still have the Muti bite which makes such sense of early Verdi but he is arguably more considerate toward his singers and a slight ralentando here and accelerando there (both unthinkable with Muti) introduced a breath of fresh air into the show; both effects timed with impeccable musicianship and dramatic sense. There are further performances of Attila at the Baths of Caracalla on 4 and 7 August at 21.00.